Today after breakfast we will celebrate Mass in Altötting, at the most visited Marian Shrine in Germany. Here in this tiny octagonal chapel, we learn of the miracle that occurred and view the statue of Our Lady, venerated for 500 years. We then board our bus and drive to Oberammergau! Upon arrival, we explore the village, visiting the many craft shops and the Oberammergau Museum. We enjoy free time for lunch, before proceeding to the theatre for the Passion Play. In the middle of the Thirty Years War, after months of suffering and dying due to the plague, the people of Oberammergau vowed to perform "The Play of the PASSION of our LORD JESUS CHRIST" every ten years. At Whitsun 1634, they kept their promise for the first time, on a stage which they had set up in the cemetery, over the graves of those who had succumbed to the plague. 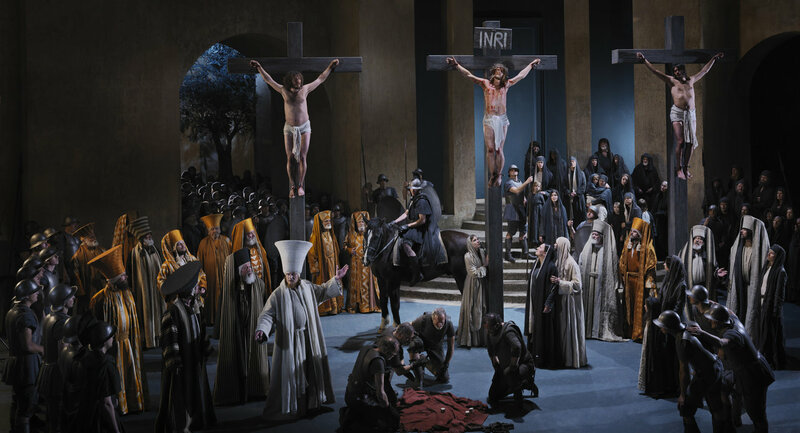 In 2020, Oberammergau will, for the 42nd time, perform the play that has been carried on over the centuries in a unique continuity. The play depicts Christ’s Passion, beginning with the entry into Jerusalem and ending with the resurrection. The structure of the play is living pictures from the Old Testament and acted scenes from the New Testament. The Play employs a large choir and orchestra. The Passion Play runs from 2:30-5PM and concludes from 8-10:30 PM. We enjoy an included dinner during the interval. Overnight at our hotel in Oberammergau. This morning we depart Oberammergau, stopping briefly at the famous Neuschwanstein Castle, to view the inspiration for Cinderalla's Castle at Disney World. We continue to Innsbruck, Austria to see the Goldenes Dachl (Golden Roof), a landmark structure located in the Altstadt section of town. It is Innsbruck’s most famous symbol constructed to mark the wedding of Emperor Maximilian I to Bianca Maria Sforza. We enjoy free time for lunch before continuing to Salzburg, and the area renown for the Sound of Music. We check into our hotel in Salzburg for dinner and overnight. Today we explore Salzburg, ancient seat of the Archbishop and the location for the Sound of Music. We begin with Mass at the Cathedral. We see the colorful old section of the town, including the Residenz Fountain and Tower, plus the Geburtshaus, Mozart's birthplace. We enjoy the unusual architecture, which lends much to the character and charm of the city. In the afternoon we visit Hellbrunn Castle with its waterplays and then take a drive to see the church in Mondsee where the Von Trapp's wedding was filmed. After returning to our hotel, we have the opportunity to explore the culinary delights of Salzburg tonight as dinner is on our own. We awaken in one of the most impressive cities in the world. After breakfast we tour Vienna, by coach and on foot! We view the Prater and arrive in Vienna's famous Ringstrasse, touting as the most beautiful boulevard in the world. On the site of the ring fortifications, Emperor Franz Josef constructed some of the most impressive buildings in the city. We pass by the Opera house, Charles Church, Parliament and City Hall. After this first impression, we will have a guided tour through the Hofburg, winter residence of the Hapsburg Emperors and continue to the Hundertwasser house with its colorful facades and golden onion towers. We celebrate Mass, then the afternoon is free for individual exploration, shopping or perhaps a visit to the Palace of Schonbrunn, the Hapsburg summer residence. This evening dinner and overnight at our hotel in Vienna. You may decide to enjoy an optional concert performance in Vienna tonight (not included). This morning, we journey to Prague. We travel across the rolling hills of Southern Moravia, passing through towns which have still retained much of a medieval atmosphere. We cross the border, leaving Austria by way of the Danube valley, arriving this afternoon in Prague. We celebrate Mass before checking into our hotel. We enjoy a typical Czech dinner tonight. Overnight at our hotel in Prague. Today, we spend the day exploring beautiful Prague, starting with Castle Hill and St. Vitus Cathedral, Vladislav Hall and Golden Lane. We visit the famous Infant Jesus of Prague at the Church of Our Lady of Victory, where we celebrate Mass. Our afternoon tour of Prague includes the Old Town with the Astronomical clock, the Jewish Quarter and Charles Bridge. Farewell dinner tonight in a local restaurant. Overnight Prague.